Found in the 13th century, Sukhothai (literally means "Dawn of Happiness") was the first truly independent Thai Kingdom, which enjoyed a golden age under King Ramkhamhaeng, credited with creating the Thai alphabet. The superb temples and monuments of this great city have been lovingly restored in Sukhothai Historical Park, a UNESCO World Heritage Site and a must-see for all travellers. Sukhothai is a small, peaceful province located on the lower edge of the northern region of Thailand, 427 kilometres (267 miles) north of Bangkok or some 298 kilometres south of Chiang Mai. The province covers some 6,596 square kilometres and is divided into 9 Amphoes(districts): Muang Sukhothai (Sukhothai City), Ban Dan Lan Hoi, Khiri Mat, Kong Krailat, Sawankhalok, Si Nakhon, Si Samrong, Si Satchanalai and Thung Saliam. 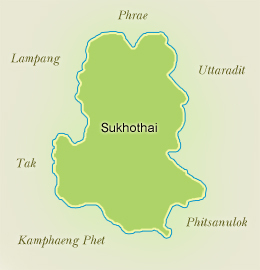 Sukhothai was the first kingdom of the Thais in this peninsula. Two princes-Pho Khun Pha Muang and Pho Khun Bang Klang Hao combined their forces and fought the Khmers who commanded an extensive empire throughout this part of the world. They drove the Khmers out of Sukhothai, a major frontier post of the Khmer Empire, and established it as their capital in 1238. Pho Khun Bang Klang Hao, urged by the people to be king, was enthroned with the royal title of Pho Khun Si Indrathit. King Si Indrathit had two sons-Pho Khun Ban Mueang and Pho Khun Ramkhamhaeng. After his death, Pho Khun Ban Mueang succeeded him. His brother, Pho Khun Ramkhamhaeng, ascended the throne in 1278 and reigned for forty years. He was Thailand's first great king. One of Thailand's finest warriors, King Ramkhamhaeng made Sukhothai a powerful and extensive kingdom which included many parts of what are today neighbouring countries. A number of ancient cities paid him tribute. King Ramkhamhaeng opened direct political relations with China and made two trips to China - the first in 1282 to visit Emperor Kublai Khan and the second in 1300 after Kublai Khans death. From the second visit, he brought back Chinese artisans who taught the Thais the art of pottery. Today, the old Sangkhalok Potteries are eagerly sought by collectors. 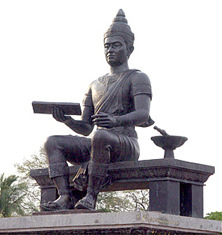 A major achievement of King Ramkhamhaeng was the revision of various forms of Khmer alphabets into a system suitable for the writing of Thai words. The alphabet that he invented in 1283 was essentially the same as that in use today. During his reign, there was prosperity and happiness. There was water in the paddy-fields and fish in the water. A stone inscription reads in part, This Muang Sukhothai is good. In the water there are fish; in the field there is rice. The ruler does not levy a tax on the people who travel along the road together, leading their oxen on the way to trade and riding their horses on the way to sell. Whoever wants to trade in elephants, so trades. Whoever wants to trade in horses, so trades. Whoever wants to trade in silver and gold, so trades. King Ramkhamhaeng also promoted religion and culture, and through his efforts, Buddhism progressed among the people. Inspirational faith gave birth to classic forms of Thai religious arts. Images of the Lord Buddha sculptured during the Sukhothai Era are cultural treasures which impart a feeling of peace and serenity. A total of eight kings ruled Sukhothai. 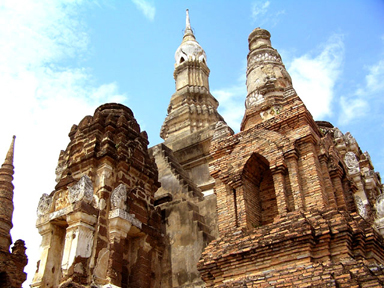 The gradual decline of Sukhothai occurred during the reigns of the last two kings. The end of this first Thai kingdom occurred in 1365 when it became a vassal state of Ayutthaya, a young and rising power to the south. Ayutthaya became the capital of Thailand before Thon Buri and Bangkok. Located 12 km to the west of today's Sukhothai, this was the capital of the Sukhothai Kingdom from 1238 to 1438 and contains many ruins from that period. Its importance has been internationally recognised and it is now a UNESCO World Heritage Site. The old city is a popular tourist attraction, and the site has seen much restoration since the 1960s. It is well maintained, exceptionally clean and well furnished with vendors, though with only a minimum of touts. The heavily restoration is worth noting, since with some ruins and Buddha figures it can lead to a feeling that it is a little over-sanitised, especially in the central zone. The other zones are much less "restored" and trips down unmarked tracks can lead to ruins in their untouched state. The whole site covers an area of approximately 70 square kilometres and is divided into 5 zones. The central zone contains the majority of the ruins and a museum. Admission is 40 baht (6 am to 6 pm) plus extra for vehicles, including bicycles. Maps can be bought at the ticket office for 3 baht. The other zones (north, east, south and west) have separate fees of 30 baht. Bicycles are the favoured mode of transport, though it is perfectly feasible to walk around the central and northern zones in 6 hours or so. Bicycles are available for rental at numerous places near the songthaew stop. There is also a 20 baht guided tour by electric tram available. Central zone - It contains 11 ruins in 3 square kilometres, interspersed with moats, lakes and bridges to some island-bound ruins. Mat Mahathat is one of the most spectacular, with a large seated Buddha figure set amongst the pillars of a now ruined sala, and a central chedi flanked by two standing Buddha figures. Wat Sra Sri also has a large chedi and Buddha figure, but is reached by a bridge to the island. There are some nice views from the other side of the lake. North zone - Wat Phra Phai Luang contains the remains of a number of buildings plus a large prang with stucco reliefs. More impressive is Wat Sri Chum, which contains a massive seated Buddha figure peering through an opening in its enclosure. Look for a stairway on the left as you enter the enclosure; it leads up and behind the buddha image, though the passage is not always open. Phra Mae Ya Shirne is situated in front of the City Hall and is highly respected by Sukhothai residents. It houses an idol of Phra Mae Ya, a stone figure with a white face and long hair, and dressed as an ancient queen. The idol is about 1 metre high and is supposed to have been built during King Ramkhamhaeng's reign as a dedication to his late mother Nang Suang. 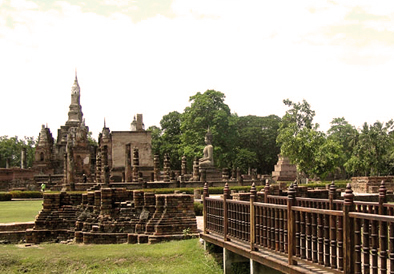 Thai Sukhothai Historical Park is located 12 kilometres from town on the Sukhothai-Tak Highway. It is open daily 8.30 a.m. - 4.30 p.m. Ruins of the royal palaces, Buddhist temples, the city gates, walls, moats, dams, ditches, ponds, canals, and the water dyke control system, which was the magical and spiritual centre of the Kingdom, are now preserved and have been restored by the Fine Arts Department with the cooperation of UNESCO, not only with a view of fostering Thailand's national identity but of safeguarding a fine example of mankind's cultural heritage. The north and the south walls of the ancient city are each 2,000 metres long, where as the east and the west walls are each 1,600 metres long. The walls contain four main gates. A stone inscription mentions that King Ramkhamhaeng set up a bell at one of the gates. If his subject needed help, they would ring the bell and the King would come out to settle disputes and dispense justice. Noen Prasat is where traces of the royal palace are found. It lies in the centre of the town and is surrounded by a moat. A sanctuary lying to the west behind the Royal Palace compound is Wat Mahathat. It is Sukhothai's largest temple with a customary main Chedi in lotus-bud shape and a ruined Wihan. Its main Buddha image (8 metres high) was installed inside a separate building. On the South stands a pedestal of a large Chedi built up in steps, the lowest platform is adorned with beautiful stucco figures of demons, elephants and lions with angles riding on their backs. Mural painting adorn this Chedi. 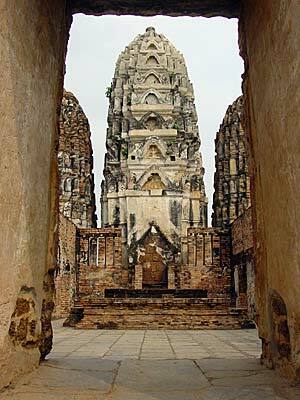 Situated among magnificent scenery southwest of Wat Mahathat is Wat Si-Sawai. Three Prangs (pagodas) of Lop Buri or Hindu-style and two Wihans are surrounded by a laterite wall. The ruin was once a Hindu shrine, but was later converted into a Buddhist monastery. Situated to the west of Wat Mahathat is Wat Traphang-Ngoen with its square pedestal, main sanctuary, and stucco standing Buddha image in four niches. There is a Wihan in front, and in the east of the pond, there is an island with an Ubosot. This edifice has already crumbled and only its pedestal and laterite columns still remain. Situated to the north of Wat Mahathat is Wat Chana - Songkhram lts main sanctuary is a round Singhalese-style Chedi. Situated near Wat Chana-Songkhram is Wat Sa-Si. Around a Singhalese-style Chedi is the main sanctuary on an island in the middle of Traphang Trakuan Pond. A large Wihan contains a stucco Buddha image. To the south stands nine Chedis of different sizes. Situated to the north of Wat Mahathat is the King Ramkhamhaeng Monument. The bronze statue of King Ramkhamhaeng sits on a throne with a base relief recording his life. King Ramkhamhaeng made Sukhothai a powerful and extensive kingdom which included many parts of what are today neighbouring countries. He opened direct political relations with China and made two trips to China - the first in 1282 to visit Emperor Kublai Khan and the second in 1300 after Kublai Khan's death. 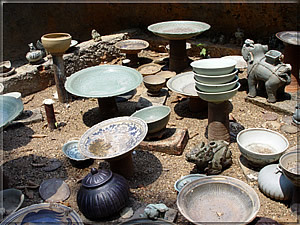 From the second visit, he brought back Chinese artisans who taught the Thais the art of pottery. Today, the old "Sang khalok Potteries" are eagerly sought by collectors. A major achievement of King Ramkhamhaeng was the revision of various forms of Khmer alphabets into a system suitable for the writing of Thai words. The alphabet that he invented in 1282 was essentially the same as that in use today. Situated to the north of Wat Mahathat is Wat Mai. The temple, having a brick Wihan as the main sanctuary, is in Ayutthaya style. The columns of the Wihan are made of laterite. Situated to the east of Wat Mahathat is Wat Traphang-Thong. The monastery is located on an island in the middle of a large pond. A ruined laterite Singhalese-style Chedi is on the island. In front of it, a new Mondop Contains the Lord Buddha's Footprint Slab that was created by King Lithai in 1390. Wat Phra-Phai-Luang formerly a Khmer-Hindu shrine but later converted into a Buddhist monastery, is surrounded by a moat. It is second in importance to Wat Mahathat. Inside, there are three Prangs like Wat Si-Sawi, but the southern and the central ones have crumbled leaving only the northern one decorated with stucco figures. In front of these Prangs are a Wihan and a crumbled Chedi; the later has a pedestal decorated with stucco seated Buddha images. A Mondop contains ruined Buddha image in four postures; sitting, reclining, standing, and walking. 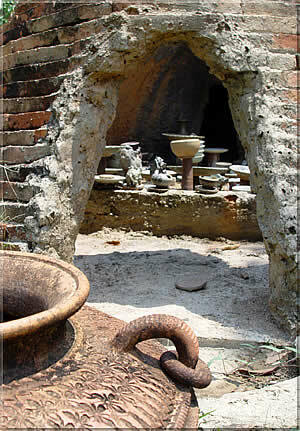 Thuriang Kiln is a site where Sukhothai celadons were made. Kilns exist in an area measuring 100 by 700 metres. Each kiln is divided into three sections, the fire area, the pottery baking oven, and the flue. The pottery found here is usually decorated by three different painted designs on their bottom: a disc, a fish, and a flower. Forty-nine kilns and small edifices are visible. To the north, a pond has been dug into the stone. 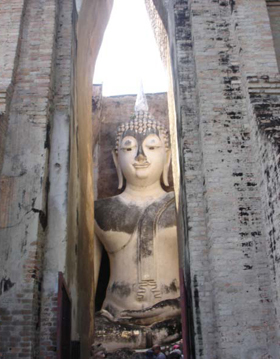 Wat Si-Chum contains a monumental stucco-over-brick Buddha image in the attitude of Subduing Mara called ''Phra Achana'' .This Buddha measures 11.30 metres from knee to knee. The mondop is 32 metres square and 15 metres high, and the walls are 3 metres thick. There is a passageway in the left inner wall itself which leads to the above crossbeam. On the ceiling of the passageway are more than fifty engraved slate slabs illustrating Jataka scenes. Wat Chang-Rop is situated in the Aranyik area. A Chedi is decorated with an elephant emerging from the base. A Wihan base and laterite columns are in front of the Chedi. Wat Chetuphon enshrines four Buddha images in different postures: sitting, standing, walking, and reclining. The outer walls of the Mondop still retains a section in the form of a slate pillar-balustraded windows. There is an entrance to the Mondop to the north. Just behind the Mondop is a small sanctuary which contains a Buddha image known locally as Phra Si Ariya, the Lord Buddha of the Future. Wat Chang Lom is located to the north of Chotwithithong Road with a bell-shaped Chedi of Ceylonese influence standing as the centre. The Chedi is situated on a 3-tiered square base with a platform decorated with a row of elephants seen by their front halves supporting the round Chedi. This type of elephant-decorated Chedi is to be seen in many ancient towns of the Sukhothai period; for example, Kamphaeng Phet and Si Satchanalai. Wat Traphang-Thong-Lang houses a square Mondop which is beautifully decorated by stucco figures in niches. The southern side portrays the Lord Buddha flanked by angels. To the west portrays the Lord Buddha preaching to his father and relatives. The northern side depicts the episode when the Lord Buddha returned to preach to his wife. These stucco figures, especially those on the south side, are masterpieces of Sukhothai art. Wat Chedi-Sung is situated near Wat Traphang Thong Lang. The upper part of the Chedi is round. 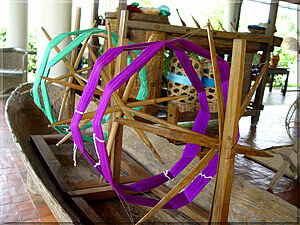 The base is constructed in three tiered stages. This interesting Sukhothai type of Chedi is of Sivijaya and Singhalese-styles. In front of the Chedi stands a small Wihan. The Ramkhamhaeng National Park (Khao Luang, Sukhothai) This exquisite national park with a combined natural and historical background covers an area of 314 square kilometers, and was declared to be a national park on 27 October, 1980. High hills and steep cliffs some over 1,200 meters above sea level, together with fascinating falls, different species to plants and wildlife are some of the major attractions available in this park offered to nature loving tourists or visitors. Furthermore, the archaeological and historical sites with ancient remains and relics make the park even more attractive, especially for critics and theologians. To reach the park by road, take Highway no. 1 from Bangkok, then at km. 414 (20 kilometres to Sukhothai) take the lest turn along the laterite road for another 16 kilometres till arriving at the park's office. Wat Phra Si Rattana Mahathat also called Wat Phra Borommathat Muang Chaliang or Wat Phra Prang, is situated 3 kilometres to the south of ancient Si Satchanalai's wall. An immense laterite Prang on a square base marks the central part of the temple. A steep staircase in front of the huge Prang leads to a room where a reliquary is enshrined. Wat Khao Suwan Khiri is also a hilltop temple situated 200 metres away from Phranom Phloeng Hill. A huge-bell shaped Chedi on a 5-tiered base is the centre of the temple. Ruins of a Wihan and Chedi, a fragment of huge stucco figures lie scattered on the ground. The similarity between some figures here and those at Wat Chang Lom in the old town of Sukhothai leads to a belief that it was King Ramkhamhaeng the great of Sukhothai Kingdom who had this temple constructed. Wat Chang Lom is an important monument within the old town of Si Satchanalai. A huge bell-shaped Chedi supported by 39 elephants, with 4 of them at 4 cardinal points elaborately decorated, marks the centre of the temple. Above the Chedi's base, there are niches enshrining images of the Buddha subduing Mara. Wat Chedi Chet Thaeo is one of the most beautiful temples in Sukhothai Province. Chedis of the different artistic styles and influence were built within the area of this temple. Mural paintings, seriously damaged, are still to be seen in some Chedi. Wat Suan Kaeo Utthayan Yai is located near What Chedi Chet Thaeo with only a dirt road in between. A large image hall lies in remains within this temple. The monastery is also called Wat Kao Hong or the 9 roomed temple. Wat Nang Phaya is famous for its delicate stucco reliefs on the remains of the northwestern wall of the 7 roomed "Wihan" or "image hall". The pillars of this Wihan are decorated within with unglazed ceramic designs. The central laterite Chedi is surrounded by lampposts and accessible by a set of narrow stairs. Wat Suan Kaeo Utthayan Noi is the only temple within the old town of Si Satchanalai with a brick building in front. The ruins of this temple consist of a whole laterite image hall with a laterite roof. Si Satchanalai Historical Park is open daily between 8.30 a.m. - 4.30 p.m.
Celadon Kiln Site Study and Conservation Center is located at Ban Ko Noi, some 4 kilometres to the north of Si Satchanalai. More than 500 kilns have been excavated up to now. Numerous celadon wares in perfect condition as well as potsherds have been discovered. The kiln is oval in shape with a curved roof and is 7-8 metres wide. The centre consists of 2 buildings situated on the kiln site area with 2 kilns Nos. 42 and 61 exhibited on site. There are also exhibitions on artifacts and on the evolution of ancient ceramic wares. 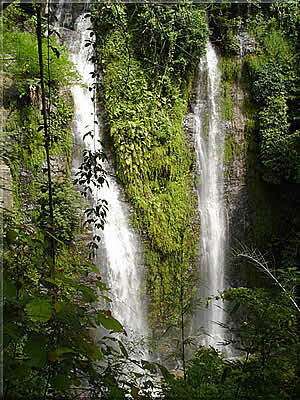 Si Satchanalai National Park has a total area of 213 square kilometres. It covers areas in Amphoe Si Satchanalai and Amphoe Thung Saliam of Sukhothai Province. 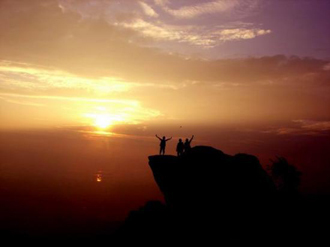 It was proclaimed a National park on 8 May, 1981. 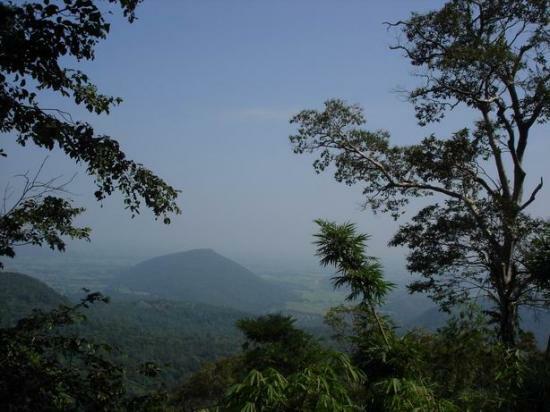 The Park's geography is mainly high, undulating mountains by a tropical jungle. 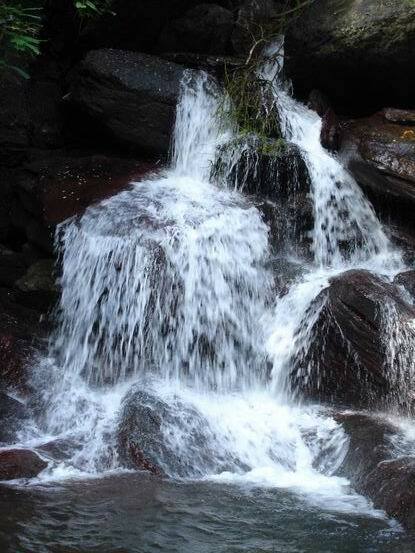 Interesting tourist sport in the park include Tat Dao and Tat Duan Waterfalls, about 3 kilometres and 500 metres from the park headquarters, respectively. The park also has a hot spring, Khangkhao Cave, and Thara Wasan Cave. Si Satchanalai National Park can be reached by car. From Amphoe Si Satchanalai, take the Si Satchanalai-Ban Kaeng-Huai Yuak route for 41 kilometres. Then 5 kilometres before the intersection to Ban Yuak, there is a right-hand road which you take for another 2 kilometres to the park headquarters. Golden Silk Museum is where abundant collections of antique Thai silks and other artifacts are displayed by Khun Sathorn, an expert on Thai Puan tribe, their culture and craftsmanship. 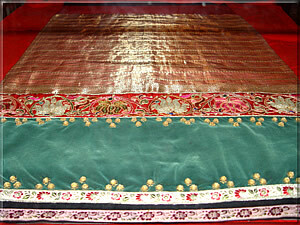 More than a hundred years old, silks made of actual gold threads is a must-see here. 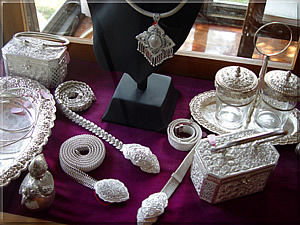 Si Satchanalai Traditional Gold and silver is not only the ordinary style of goldencraft commonly being sold and purchased, but is the golden ornaments being renewable hand making by local hand weaving.The goldsmith usually copies the traditional designs found from ruins and remains in the area of Si Satchanalai Historical Park. 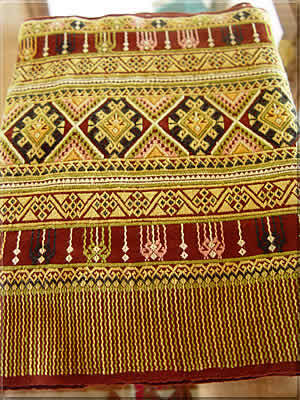 The local people of Hat Sieo village in Si Satchanalai who have conserved long lasting typical silk cloth made with colourful and different designs, have produced the various styles of cloth for sale. 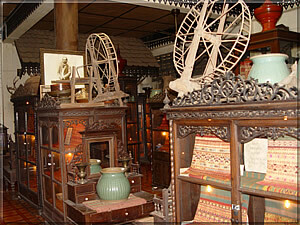 Sukhothai used to export enormous numbers of its pottery products in old time. The sustaining production is still ready to serve the tourists who want both to purchase and to have snapshots on the kilns. A Buddha figure at the market at the historical park. They are available in all historic styles, sizes and materials. Remember that it is considered bad luck to buy a Buddha for yourself, so you should be buying gifts! Si Satchanalai Ordination Celebration or "Buat Chang" is a local event held annuall during 7-8 April at Ban Hat Sieo, Amphoe Si Satchanalai. It features a spectacular procession of ordination candidates in colourful costumes on the backs of some 20-30 decorated elephants. Loi Krathong and Candle Festival is held annually on the full moon night of the 12th lunar month at Sukhothai Historical Park. Activities during the festival include krathong floating,a fireworks display,and local games and performances amid the glamorous atmosphere of Sukhothai Historical Park. Air-conditioned buses depart from Bangkok’s Mochit 2 Bus Terminal to Sukhothai daily between 9.45 a.m. and 10.20 p.m.,frequently during the morning. The journey takes 7 hours and costs 256 baht. Call 0 2936 2852-66. Private bus companies which operate daily bus services to Sukhothai are such as Win Tour (Tel: 0 2936 3753 or 0 5561 1039), Phitsanulok Yan Yon (Tel: 0 2936 2924-5, 0 5525 8647). Sukothai only has a small bus station, but the city can be easily reached from the North, South, East and West. From Mae Sot: Minibuses run regularly from the station behind the market. The journey takes about 3 hours, passing through Tak on the way. 130 baht. From Phitsanulok: Frequent buses operate from the main bus terminal and take about 1 hour for the 58 km trip. From Bangkok: There are direct buses from Bangkok, but to avoid a long uncomfortable ride, take the (express) train (8 hours) to Phitsanulok and go by bus from there (1 hour). From Chiang Mai: Buses from the main bus terminal take about 4 hours. The cheaper local buses make many stops and take about 5 hours. There are no trains going directly to Sukhothai. One may travel by train to Phitsanulok and then take a local bus to Sukhothai, some 50 kilometres away. Contact Bangkok Railway Station Tel. 1690, 0223 7010, 0 2223 7020 or visit www.srt.or.th for more information. Bangkok Airways has daily 1-hour flights from Bangkok to Sukhothai and also services the Chiang Mai-Sukhothai route. Sukhothai Airport is about 40 kilometres north of the town. For more information, call 0 2229 3456–63 or 0 5564 7225-6. The best way to see the ruins in the Sukhotai National Historic Park is by bicycle. These can be rented from a shop opposite from the main park entrance. However, to see the new Sukhothai, it's recommended that you rent a motorbike. The purple #1 "Song Thaew" car travels to and from the bus station, which is about 3 km out of town. They run the length of Charodwithitong Road (say "Thanon Charodwithitong"). The fare is 10 baht. The large blue "Song Thaew" car to Old Sukhothai leaves from a bus stop on Thanon Charodwithitong about 100 meters west of the bridge. It stops about 750 meters from the entrance to the central zone of the historic park. Fare: 20 baht. Rent a bike When you get to the Old City (Muang khao/Historical Park), make sure you rent a bike, things will get easier and you will enjoy all the sites and explore the ruins of Old Sukhothai. Visit Pra Mae Yah Shrine (at the new Sukhothai) Pra Mae Yah has long been respected as the mother of Sukhothai people. Visit to pay your respect and ask her for what you wish..
Visit the park at sunrise and admire the Buddha figures in the orange glow of the morning sun. 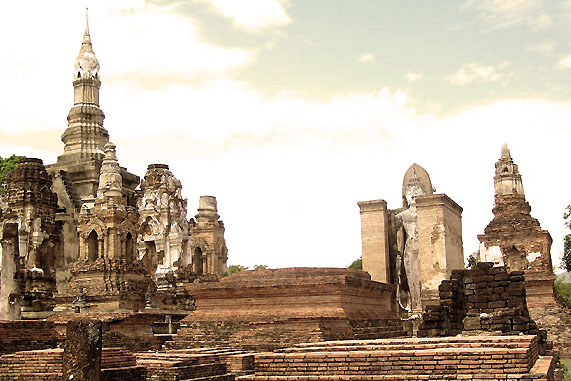 Pay a visit to the ruins at Si Satchanalai Historic Park, 55 km from new Sukhothai. Walk around the fresh market (In new Sukhothai) in the early morning and try the tastes of many kinds of local food Sukhothai people like to have e. g. sticky rice with deep fried pork, sweet deep fried beef or spicy pork salad wraped with the banana leaf. Sukhothai has plenty of fresh water fish with unbelievably low price. Therefore, try Thai dishes made of fresh fish before you leave and you will fall in love. Terrace 'n Trees Restaurant A Thai Restaurant that also serves American and a bit of Chinese. 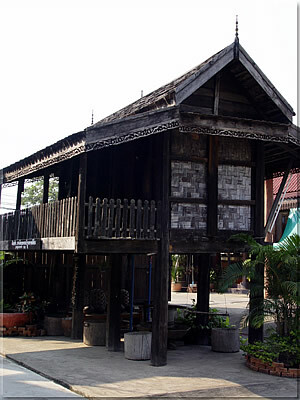 A wooden home-style 3-storey building located at the back of Sawasdipong Hotel with options of open-air and air-conditioned. This is the place where you can find all those dishes with familiar names like "Tom Yum Goong", "Tom Kah Gai", "Fried Rice", "Pad Thai", "Cashew Chicken" and "Som Tum"..
Coca Sukiyaki Chinese Restaurant An air-conditioned Chinese restaurant where lots of Sukhothai people take their families for Sukiyaki and yummy Chinese. Famous for its very best fried rice, noodles as well as other international Chinese dishes. Dream Cafe Right next door to Sawasdipong Hotel, this restaurant offers more of American-style dishes with pretty interesting atmosphere. "Sukhothai" Noodles Shops - It's a Must for visitors to try Sukhothai recipe noodles often voted as the best noodles recipe in Thailand. There are lots of noodle stolls in town but the noodles shops often praised by most visitors including Sukhothai natives are such as "Kuay Tiaw Ton Gra Jee" and "Kuay Tiaw Tar Pui".. Just ask anyone, they know. Sukhothai Night Market, There are varieties of local food that you can find in the night market in new Sukhothai. The night market is called "Toe-roong", which means "'til dawn". It also covers the area that the food stolls are along "Rachathani" temple's fence. Kru Eew, One of Sukhothai noodle restaurants in new Sukhothai, there are not only Sukhothai noodle but also Sukhothai style padthai, vietnamese food, dessert, etc. The restaurant is only opened in the day time which mainly serves for brunch and lunch. Fueng Far, The restaurant that mainly serves for dinner. It could also be a drinking place which ou can enjoy sipping beer by the "Yom" river. The food is called "Fish food" - the plenty of Sukhothai local fish (Pla) dish especially spicy dishes e.g. Tom Yom Hua Pla (Fish head tom yum), Look Chin Pla Krai Luak Jim ('Pla Krai' - one type of fish, it's the Pla Krai fish ball boil and dip with spicy suace - recommended), Kob phat kra pao (Stir fried basil frog). The restaurant is located by the Yom River, it takes 1 minute by motor bike from the beginning of the "Wat Koo Ha Suwan" Soi (the first Soi on the right when you cross the bridge from the busy side of the city). Well, it is not recommended you to walk there because it is quite dark.